Fashion Week may have come and gone, but I am still digesting the 20+ shows, events and parties and going through gift bags that have taken over my bedroom floor. After attending a full day of shows on September 12th, I’m glad I decided to end the night with the VMA Pre-Party to celebrate the Video Music Awards, held at the MTV Building at 1515 Broadway. It was a madhouse getting in, but was well worth it, as I made my way through the celebrity gift suite. 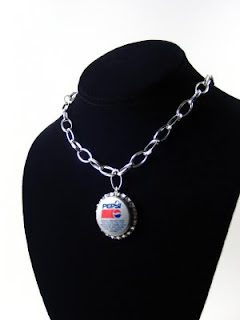 I absolutely loved the vintage bottle cap jewelry from POParazzi, by Designer/CEO Stephanie Reilly and Creative Director Michelle Reilly. The necklace is lightweight, with an adjustable stainless steel chain, perfect for my petite neck! The bling around the cap is made with Swarovski crystals. 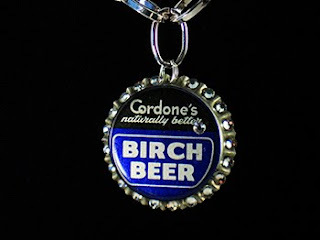 The Birch Beer necklace is one of my favorites, which looks great with dark denim and a tank top or button down shirt. It’s one of the best sellers, along with some of my other favorites – Pepsi and Coke Classic and Cherry Crush. 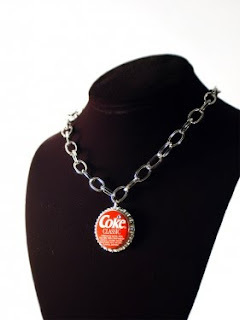 Most of the bottle cap necklaces are in the $40-$50 range, but for the month of October some of the necklaces and bracelets are as low as $30 on POParazzi’s website! I am thinking the necklaces would even make an excellent gift for my nieces. They are only 8 and 9 years old, but I can totally see them sporting these fun pieces. This Friday, October 16th, join POParazzi at the Hamptons Trunk Show at Ava’s Boutique: 6-9 pm, 71 Jobs Lane. RSVP at 631-377-3102. I met with Enovia Bedford, President and Head Designer of Accessory Remix*, offering jewelry and sunglasses on her website. When I asked Enovia what she had that was fashionably petite, she presented me with a wine-colored bow tie necklace, which I think would look great with a black tank or a black jersey dress. 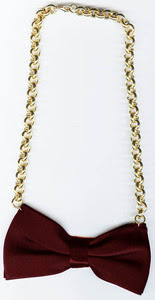 Accessory Remix* also offers link chain ties, in yellow, red, white, black, hot pink and black and gold stripe. I love the chain shades – sunglasses with jewelry attached to the frames, eliminating the need for earrings or necklaces. Stoney Clover Lane was started by 2 sisters, Kendall + Libby Glazer. 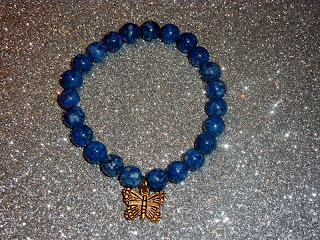 Their bracelets are custom made with charms and beads from all over the country. I like the fact that these wood or colored bracelets are custom made, allowing you to reference designs from their photo gallery or specify which colors/charms are of interest to you. 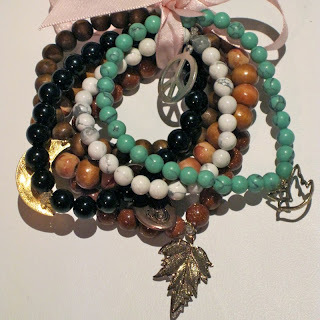 I think these bracelets are wearable with a dress or jeans. You can wear one bracelet or multiple. 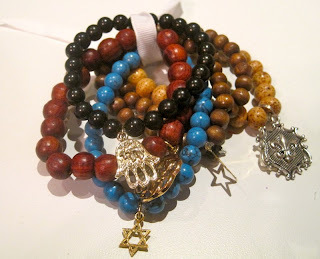 I like the look of wearing multiple bracelets in various colors. Stoney Clover Lane dedicates 25% of each sale to Dream Foundation, an organization that enhances the quality of life for individuals and their families at the end of life’s journey, by helping them find peace and closure with the realization of a final wish. 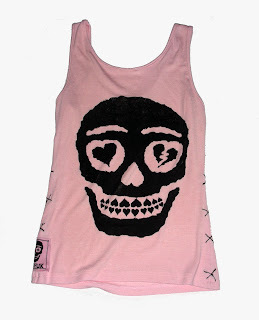 When I met up with SYC FUK by Bucky Bakes, I was really drawn to the skull design on the back of the girls’ SYC FUK limited edition tank top. SYC FUK stands for Street Youth Couture From Unwanted Kids. SYC FUK makes guys and girls apparel, including tees, tanks, shirts and hoodies, worn by many celebrities and bands. SYC FUK definitely has that LA, punk rock, edgy and rebellious feel. 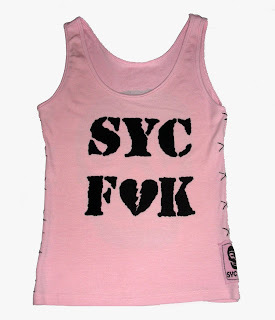 The smallest size available in the SYC FUK tank is a S but since it’s fitted it fits me like an XS. It seems really tiny but stretches nicely when you put it on, so that it is longer than expected. I absolutely love the soft, luxurious feel of the tank and the contrast “X” side stitching.